Carrowkeel is an imposing and fascinating monument of prehistoric Ireland dating as far back as the Neolithic. Join us on a visit to the megalithic tombs. The location is what makes it- quite remote and isolated at the top of the Bricklieve Mountains with beautiful views of five counties from Cairn K, which is the highest point of the complex. It’s quite easy to fall in love with this spot! Of the four passage tomb cemeteries in Ireland this one is our personal favourite. 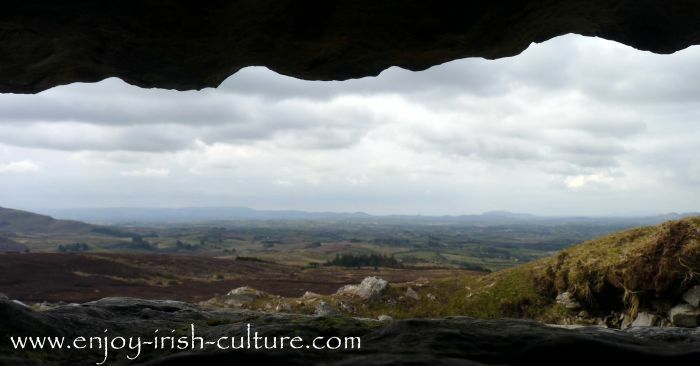 The other megalithic tombs are at - Bru Na Boinne (with the best known tomb at Newgrange), Lough Crew, and Carrowmore. Keep in mind that the photos on this page were taken on a dreary winters day, but they will give you an impression of the structure of the landscape and its' rugged beauty. The tombs are between 5400 and 5100 years old which makes them 700 years older than Newgrange and older than the pyramids of Giza. 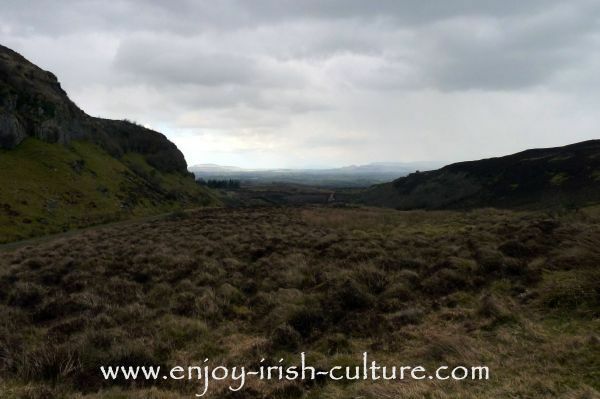 Unlike the younger Bru Na Boinne sites, this one does not have any prominent rock carvings. The cairns are much simpler, and a lot smaller. The complex contains no less than fourteen tombs. From up here one can see both Knocknarae, and Carrowmore, two important and related Neolithic sites in the area which were older and of the same culture. Cairn G has a roof box which is similar to the roof box at Newgrange. See it on the photo above. Newgrange is oriented towards the winter solstice, where cairn G here is oriented towards the summer solstice, allowing light into the tomb at sunset in and around summer solstice. The site had been all but forgotten about and was rediscovered by accident by Praeger during a botanical survey of the area in 1895 although it appears that locals knew about it. A local protestant cleric had written to the newly formed archaeological society of the south east in 1854 making them aware the sites' existence. The highest spot is at Cairn K. This spot is 321 metres above sea level and offers beautiful views over five counties. Find out about sister sites at Newgrange and Carrowmore. 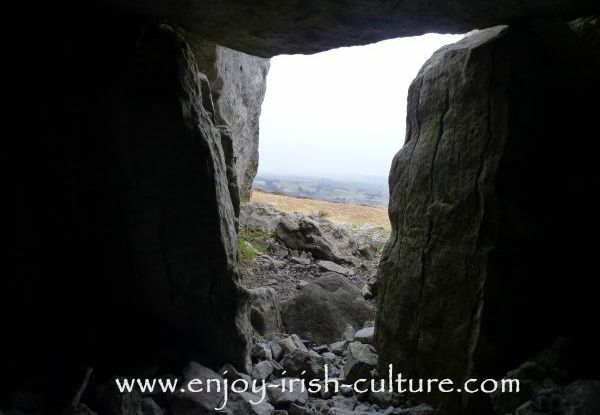 Find out tourist information about Carrowkeel here. Find out more about neolithic Ireland. 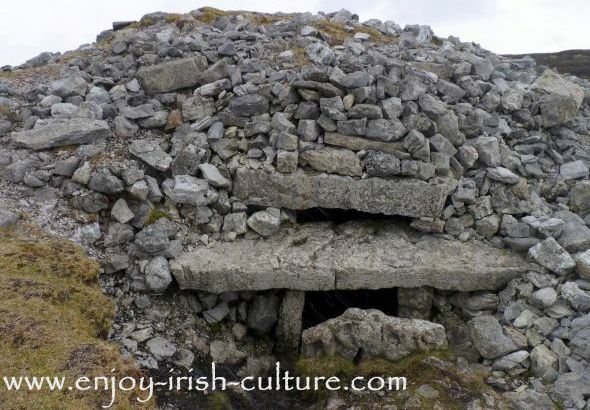 Who Built The Tombs At Carrowkeel? Not a lot is known about prehistoric Ireland as far back as the Irish Stone Age. Most artefacts won’t survive for that length of time. What we know is that the culture who built the tombs was settled. They probably lived on the plateau below which houses the remains of a Stone Age village. They were Neolithic farmers. Most likely, they worshipped the earth as the bringer of life. There was a botched excavation here in 1911 by Macalister which left some of the cairns in ruins. It turned up some finds of Bronze Age pottery as well as bone deposits indicating that the complex was used for a long time. This coincides with recent (2004) carbon dating of the Stone Age village below, which found there was activity on the site during the Neolithic into the Bronze Age. How exactly the tombs were built we don’t know. Some of the rocks were transported over long distances. Was it a community effort? Was there a religious class who enforced the building of these monuments? Was there coercion involved? We are left with many questions about prehistoric Ireland. 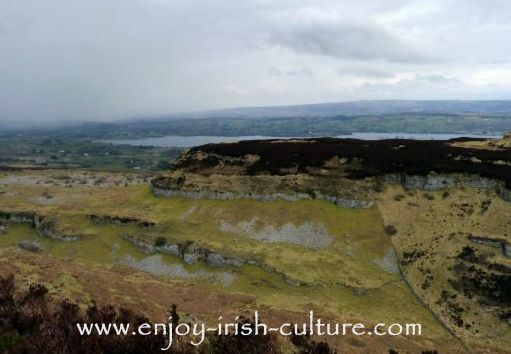 We hope you enjoyed this article on one of County Sligo's sites of ancient Ireland. If you like what we do on this website, please support us with a social shout out! You will find social options both at the top left and at the bottom. 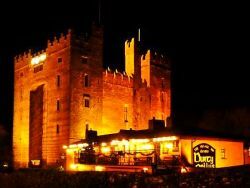 Thanks a million and warmest regards from Irelandfrom Susanna and Colm.